UNITED KinKdom: What Are The Odds? Earlier this week I went to the Royal Ascot horse races. I've been going for 4yrs now to help my friend showcase his hats, but this year was special as it was my 1st time without wearing a weave. 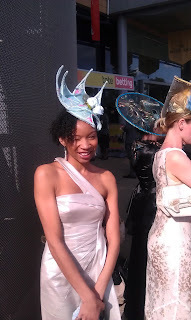 Royal Ascot is basically a big horse racing event that takes place every year. The horses race, the bookies take your money - I mean bets, the men try to calculate the best odds and the women strut around in fancy outfits particularly Spectacular Hats! The Queen, Princes Phillip & Charles, and Camilla arrive. All the same its a fun day out. ....ok, so now imagine my absolute, overwhelming, I can't actually form a sentence, shock, surprise and amazement, when the lady whose shoulder I just tapped turned out to be none-other than American Super Model & My 1st ever featured Afro Hair Inspiration - WAKEEMA HOLLIS!! I was so startled that I could hardly say her name. In fact the first thing I said was "You look familiar..." (What a bloody Twaticus! lol). The funny thing was, when I did eventually manage to blurt out "YOU'RE WAKEEMA HOLLIS!" she seemed really flattered and surprised that I knew her name, lol. Understandably the chance meeting with Wakeema, made my day - and saved me money. I was so excited I didn't watch a single horse, race or place another bet after that. Instead I kept turning on my camera and looking at my pics with Wakeema. 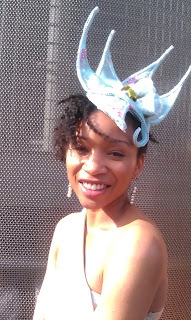 I may've won nothing on the nags that day, but meeting Wakeema was like hitting a #NaturalHair Jackpot! Click here to see ALL THE PHOTOS FROM ASCOT on FACEBOOK. Checkout pics of Wakeema Hollis on the AFROS & INSPIRATION Page on United KinKdom and on Facebook.